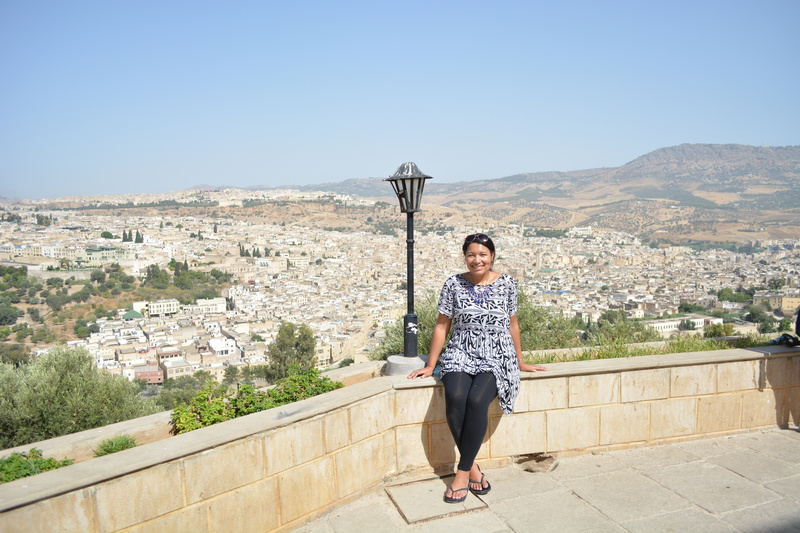 I knew from yesterday’s introduction to Fes that I would like city, but I realized today that it will probably be my favorite cities in Morocco. 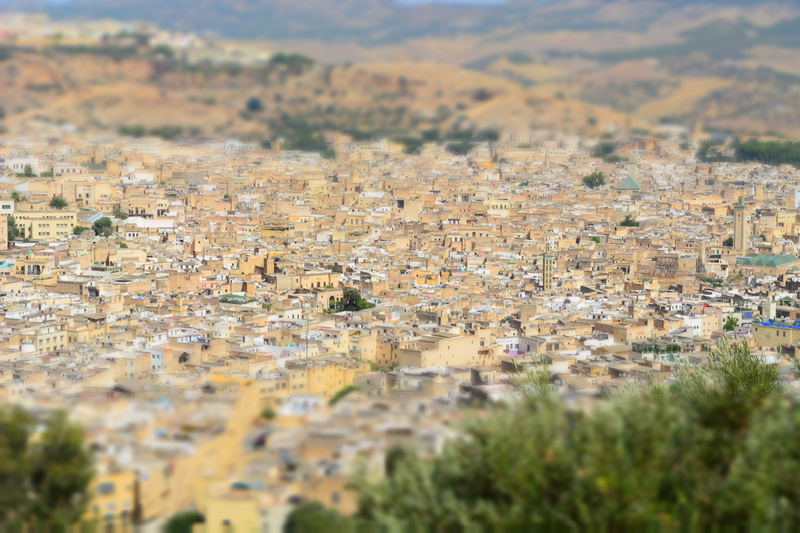 It’s a beautiful city, for one thing, and it’s filled with some of the happiest people in Morocco. Today we had another local guide take us around his hometown. He was extremely friendly, with a bubblier personality than mine (which I thought was impossible! ), and a noticeably deep love for Fes. 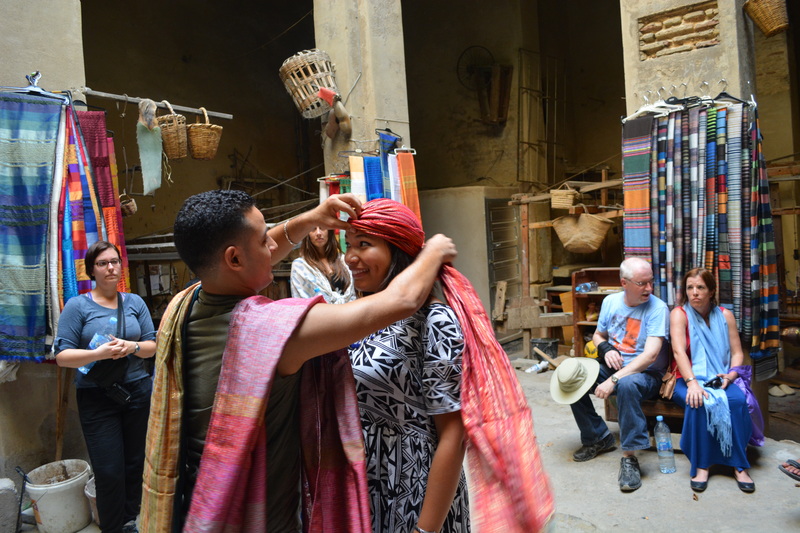 I don’t think there was a single moment on the 8-hour tour that he didn’t have a smile stretching from ear to ear as he talked about the history of Fes and its people. Oh he was so contagious. 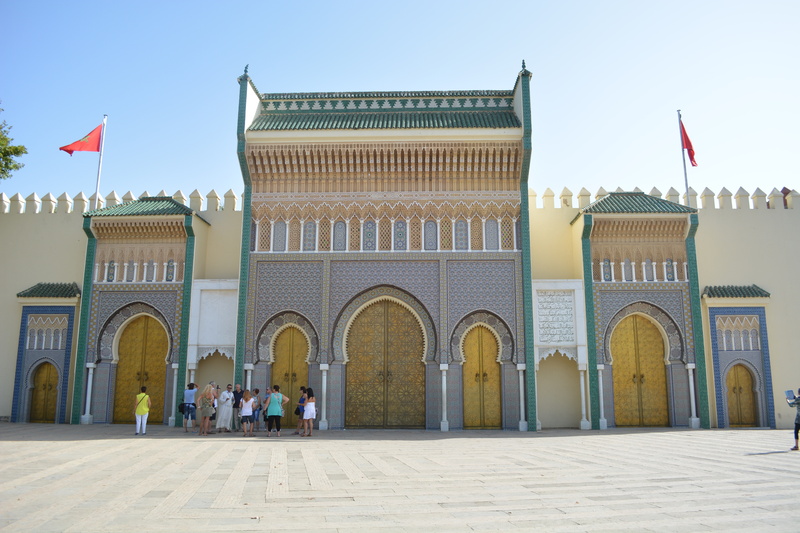 Our first stop was at the gates of the central palace in Fes. Eight gates provide access through the huge walls that surround the palace, but we were only allowed to take pictures of one because the ruler does not want any photos of the other gates or the guards standing in front of them. We continued on to see a mosque which is one of the oldest and biggest in a North Africa. Along the way, we even stopped at a school, which was a tiny room with two rows of desks for young children. There, the children learn and sometimes learn to sing passages of the Koran. In fact, the guide told us that the Koran was the only thing taught in school, and children went to school for years until they had the entire script memorized. I know how religious Morocco is and how important the Koran is a the sole guiding doctrine in Islam, but I’ll admit I was fascinated to hear that’s all they children learn. 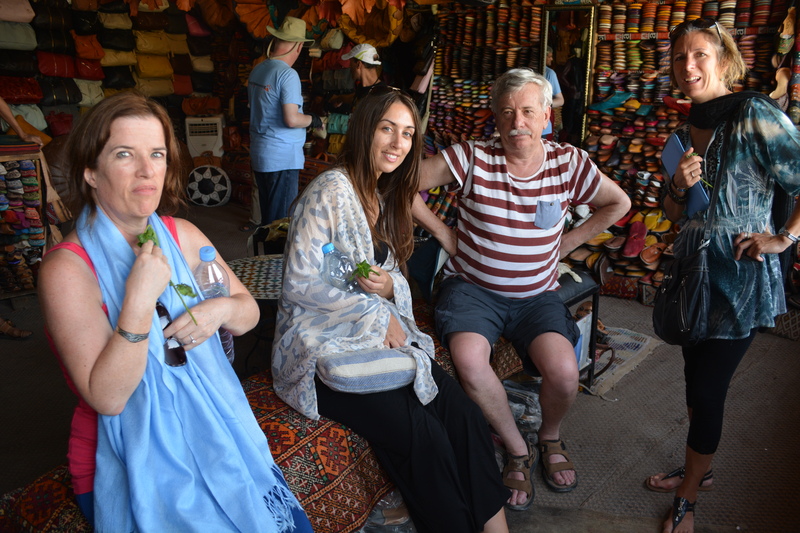 We continued walking though town and made a few stops at artisan shops where we learned how some Moroccan crafts are made. 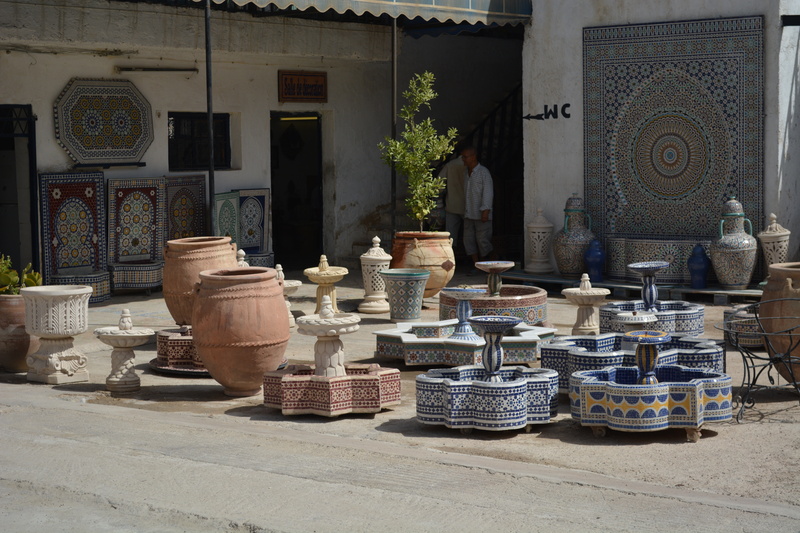 The first stop was at an open-air pottery factory. 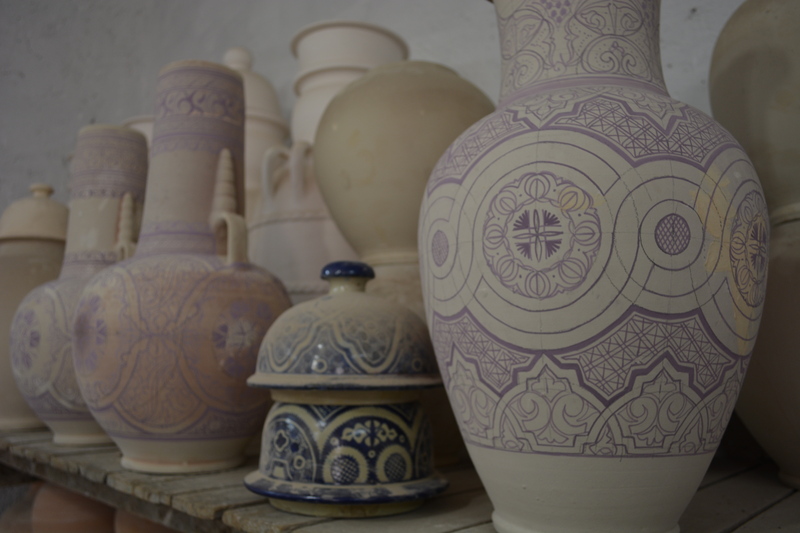 We observed men soaking raw clay in water to soften it and then putting it on a pottery wheel (operated by a foot-pedal) and forming it into plates, vases and jars. A guide explained to us how afterward, the men paint the pottery with different minerals that change colors when heated in the kiln. 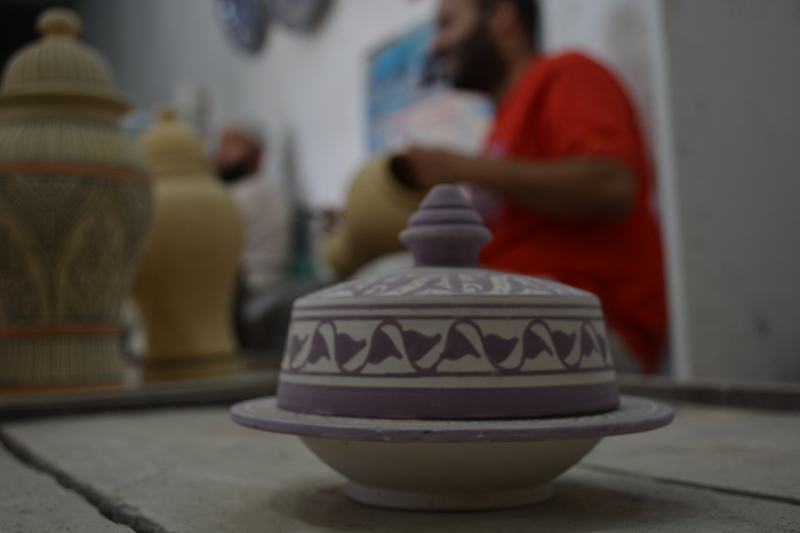 We got to watch a few workers designing elaborate flowery patterns on the jars which were absolutely beautiful. I have a new level of appreciation for the work that goes into making pottery. At the end of the tour, we of course got dropped off at the factory outlet store. Yes, I bought something, but it was the cheapest piece of pottery I could find in the store: an egg holder. But I found the most colorful one and I love it to pieces, probably my second most favorite souvenir of the tour. What’s my first favorite, you ask? (Okay I know you did ask and probably don’t care but humor me). 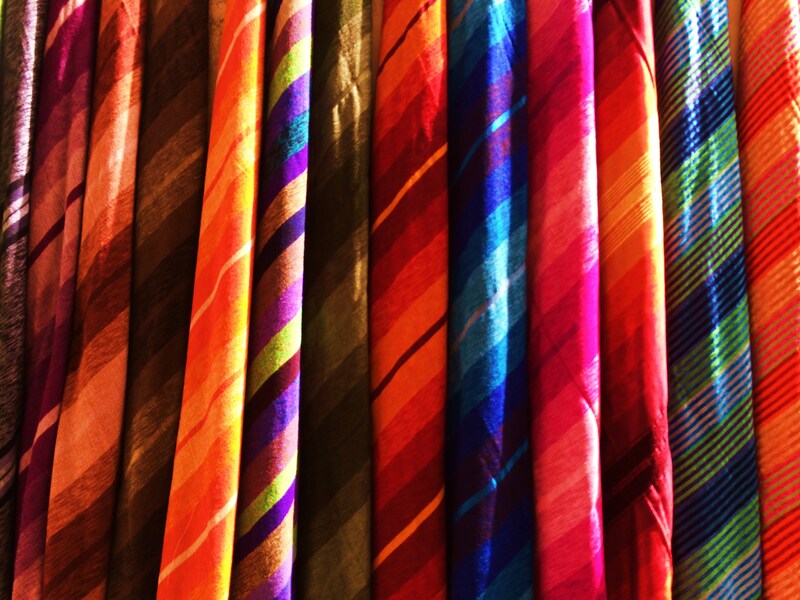 It’s a scarf I bought at a small shop where we learned how scarves are made. We walked into the shop toward the end of the tour and were immediately overwhelmed by the colorful lines of thread strewn everywhere where about the dingy, dimly-lit workshop. On three walls, we saw local men weaving great amount of raw silk from eucalyptus plants, cotton and wool into string. Form there, they weaved the string into beautiful blankets and scarves. I was pulled into a demonstration where a young man about my age showed the group how to tie a scarf like Moroccan women do, to hide the hair an face. 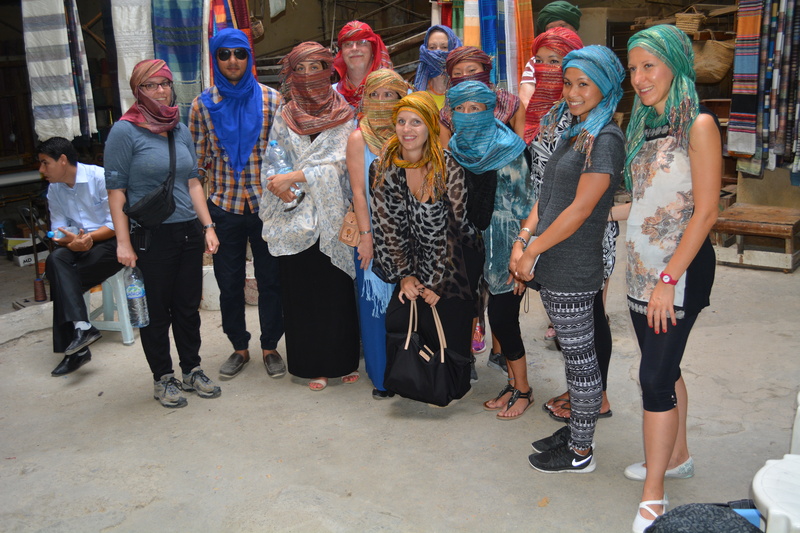 Then the rest of the group joined in and after a few minutes, he had tied scarves around all of us in two different ways for women and turban-styled way for me. After pictures and a few good laughs, we got a chance to buy some scarves (at a very cheap price compared to how much work went into making them) and then headed on our way. If you’re still wondering about the scarf I bought (you’re humoring me, remember), it’s an electric blue one with subtle teal stripes and to me looks like the perfect ocean. It’s absolutely gorgeous. 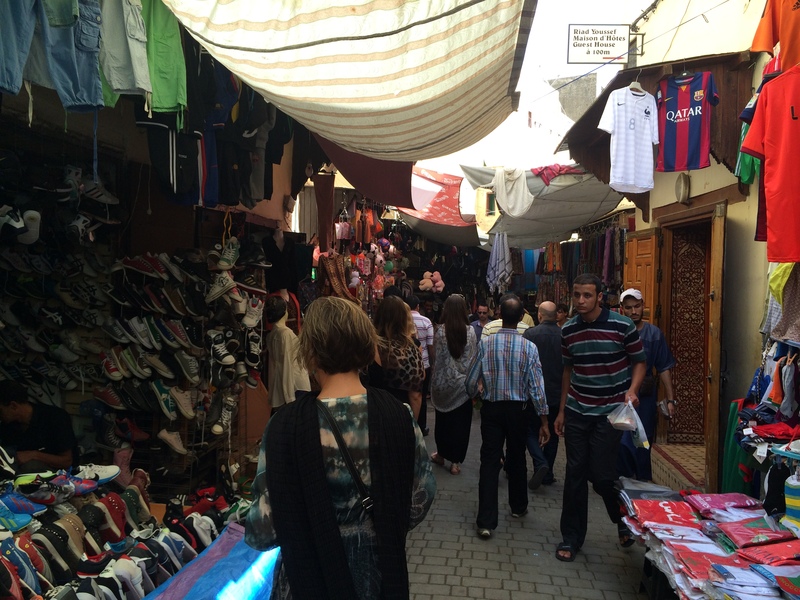 We spent the largest portion of the day journeying through the medina. 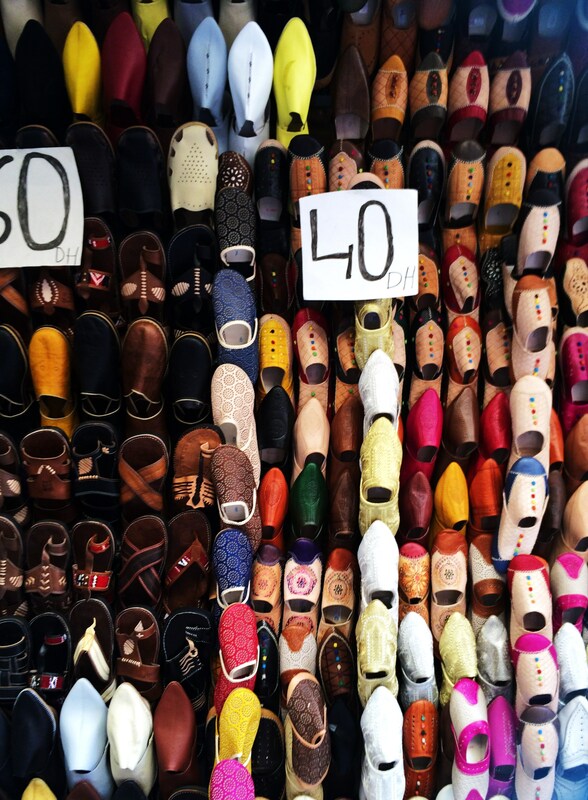 It’s one of the largest in Morocco and is comprised of more than 9,400 alleyways. I wouldn’t recommend that any tourist walk through it alone without a map or an extremely heightened sense of direction. The streets of the medina are lined with rows and rows of shops. Our first lap through was in the meat shop, where we were presented with lamb’s heads and soon-to-be-chopped-up chickens in cages. Honestly, I wanted to vomit after that walk — the smell alone was enough to make me gag — but I had to tell myself that this is how many people in present and share food in other countries. It’s just a cultural difference. 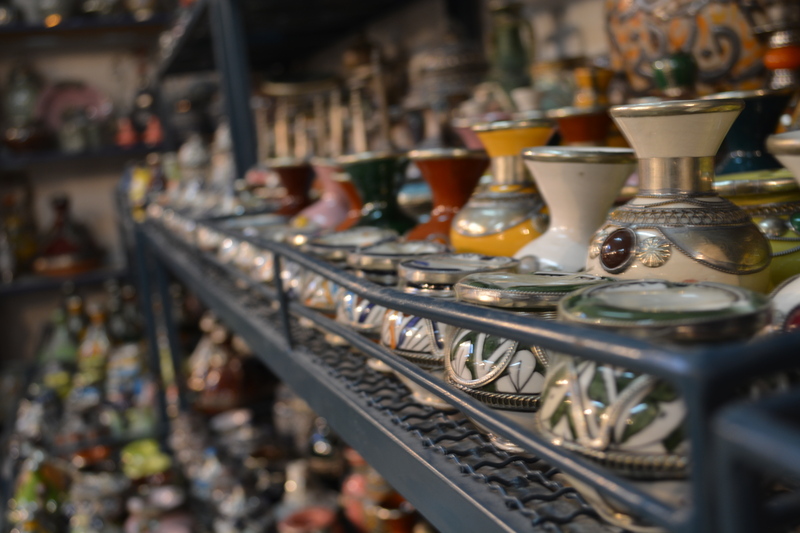 As we walked through other parts of the medina we saw plenty of shoes, scarves, gowns, jewelry, wallets, perfumes, nuts and future, tiny cafes, and even homes because many people actually live in the medina. The spaces we walked through were barely wide enough for two people to walk side-to-side. Three of our group members even got lost because they got stuck behind other people walking through the medina and were separated from the rest. Luckily we launched a few successful manhunts and eventually got those people back to safety, though we all had a few heart attacks along the way. 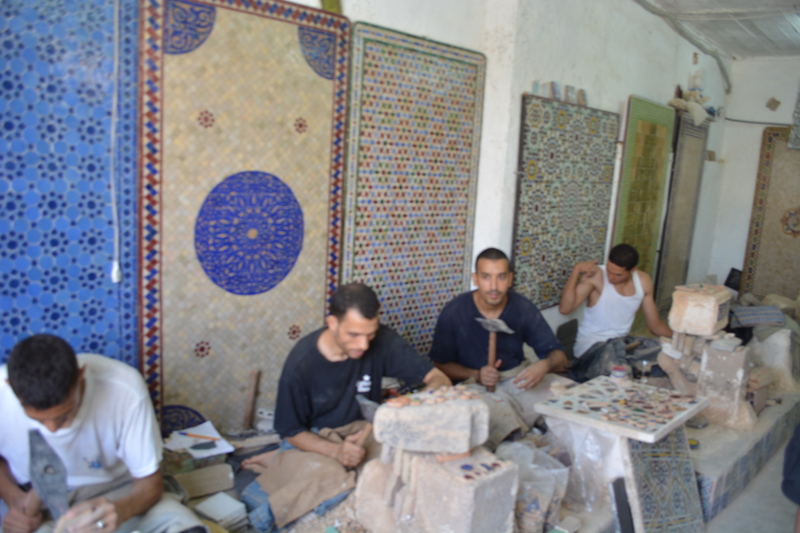 Another craft Fes is known for is leather-making, and we were lucky to visit another workshop in the medina where we learned how leather was made. To be frank, I didn’t listen much because I was so overwhelmed by the smell in the workshop that I had to stick my head out of a window for fresh air. I did at least pay attention to the shop, where every inch of every wall, even the ceilings, were covered in leather products from purses, wallets and jackets, to shoes, pillowcases and bean bag chairs. I didn’t buy anything there because I’m not huge on leather, especially after seeing the dead animals’ skin soaking in large pots to wash out the blood, but I do know how important leather is for many villages as a vital material for warmth and durability. Again, it’s a cultural difference. After several hours and a quick lunch break, we left the medina and headed back to the hotel. It was only 6 p.m., but it had been a long, hot, exhausting day of walking and absorbing information and all fourteen of us were pooped. There was no group dinner that night, but a group of eight or so of us went to the hotel bar for snacks, drinks and shisha. As usual, I’ll spare any incriminating details, but it was a very fun night and a marvelous way for us to get to really know each other. Wink.